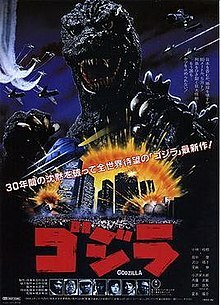 Thirty years after the giant monster Godzilla terrorised the people of Tokyo, the invincible beast returns. After Godzilla destroys a Soviet nuclear submarine Japan finds itself caught between both Cold War super-powers, as both the USA and the USSR threaten to launch a nuclear strike on Japanese soil to eliminate Godzilla once and for all. The Godzilla movies were a mainstay of Japanese cinema for two decades after the original’s 1954 release. They may have started with the titular monster as a terrifying and destructive force of nature, but they soon transformed him into a sort of light-hearted anti-hero as the films themselves segued into more child-friendly entertainment. As with all Japanese cinema, the Godzilla films struggled to find an audience in the 1970s; Terror of Mechagodzilla, released in 1975, was the final instalment. As the character’s 30th anniversary approached, however, the Toho film studio elected to bring Godzilla back. The revival film, released in 1954, ignored every previous film bar the first. This new production returned the character to his destructive height, without any rival giant monsters to fight, and re-started the franchise for a whole new generation of viewers. Godzilla (often retitled as The Return of Godzilla, and directed by Koji Hashimoto) is a well-crafted and traditional giant monster film. It neatly updates the context of the story to reflect a then-contemporary 1980s sense of geopolitics. On his approach to Japan, Godzilla destroys a Soviet nuclear submarine. That almost sparks off a global war when the Russians blame the Americans for the attack. Even once the truth is known, both the USA and USSR demand the right to launch a nuclear strike on Japanese soil to kill the monster. Japan is left as an innocent pawn in the middle. It is a smart advancement on the nuclear fears that inspired Godzilla’s creation in the first place. Godzilla himself looks great: the suit has benefited from a subtle redesign, with a more realistic jaw and expressive eyes. There is an enormous charm to rubber-suit monsters, and the scale model cities that they rampage through. The beauty of the Godzilla movies – and this is an excellent example – is how the films can amuse you with the visibly fake scenes of actors in costume trashing plastic and cardboard buildings, before a particular shot or moment will leap out and suddenly feel remarkably realistic and effective. It’s tremendously enjoyable every time. A lot of work is done here to make Godzilla a believable living creature. He has a personality, and shifts from curiosity to rage very well. As with all of the Godzilla films, the story is largely driven by a cast of scientists and journalists. It is most often fairly stereotypical stuff, and is certainly is here, but as with the visual effects there is a wonderful sort of charm to their scenes. Yosuke Natsuki is a deliberately archetypal pipe-smoking scientist, explaining the film’s various pseudo-science theories in a classic ‘Well, as you know Bob’ fashion. Ken Tanaka and Yasuko Sawaguchi give their full effort to playing the two lovers Goro and Naoko, brought together in the most unfortunate of circumstances. Their best material comes during the film’s final act, in which they become trapped in a Tokyo skyscraper in a classic disaster movie mode. Godzilla’s 1984 edition does precisely what it was designed to do: relaunch the franchise for a new generation of viewers, keep the classic look and aesthetic of the earlier films but give them a slightly more mature and darker tone. This second set of Godzilla films ran for seven more films in total, before things were rebooted entirely with Godzilla 2000 in 1999.